Many people choose to spend winter in the warm sunny climate of the Costa Blanca. When spring arrives and it's time to go back to the UK, why take your caravan back home, only to bring it back again the following winter, when you can leave it in our parking facility? 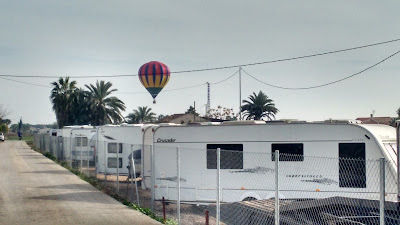 We have many clients who take advantage of our convenient storage, people who live locally who don't have space to park a caravan, motorhome or boat, people who spend the winter and return home for summer, people who use their caravan for holidays in Spain and have limited time off work, simply jump on a plane, hire a car while we deliver your van to your campsite and collect at the end of your holiday. We are a fully registered and legal provider of short / long term secure storage and parking for 5th wheels, RVs, American travel trailers, caravans and boats, situated between Catral and Dolores, close to Alicante on Spain's sunny Costa Blanca. Perfectly located for many campsites in the area. The secure, fully fenced and gated site is situated down a private, dead end lane off the CV861 in Dolores. Visits are strictly by appointment only. Additional security is provided by a further gate at the top of the lane leading off the main road, a raised bank that surrounds the compound, surveillance cameras and the fact that the proprietors live on site. Storage / parking rates (see table below) depend on vehicle size and duration required. Prices are in Euros, inclusive of IVA. The discounted rates only apply when the full amount is paid in advance. Due to extra administration costs, customers requiring long term storage who wish to pay monthly, will be charged at the relevant 1 month rate. Weekly rates are 35% of the 1 month rate and daily rates are 6% of the 1 month rate. 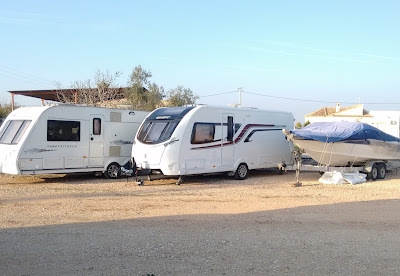 We provide a collection and delivery service for caravans, 5th wheels, travel trailers and boats on trailers from €35 locally (5th wheels, travel trailers from €60). We can collect and deliver from or to anywhere in Western Europe. Other services can be arranged including airport transfers, washing and polishing, awning erection, green ground matting laid and on site servicing by an NCC approved mobile workshop. As many of our customers are from the UK, with Sterling accounts, bank charges for clients that wish to pay by transfer can be quite expensive. However, Monster Moovers recommend Transferwise for international transfers as they give the current actual rate at the time of the transfer and charges for a €325 annual spot for example, all you pay is £1.81 (at the time of writing). Click on the banner below to go directly to Transferwise. For terms and conditions, please see below. For more information, please contact us, either by phone / WhatsApp (0034) 691161165 or preferably, drop us an email: storage@monstermoovers.com. Although we can't be members of CASSOA (Caravan Storage Site Owners Association) as we aren't in the UK, we fulfill their criteria use their standard terms and conditions. 1. All stored goods must be insured and kept insured during the period of storage. Monster Moovers has the right to inspect insurance certificates. 2. All personal effects and valuables must be removed from the stored goods and the windows and doors to remain locked during the period on the site. 3. Wherever possible and applicable, all gas bottles are to be removed from the stored goods (or at the very least, disconnected and turned off) and no other noxious, dangerous, hazardous or explosive items are permitted. 4. All stored goods and the allocated plot area must be kept tidy and no litter left behind. 5. Stored goods must not be offered or advertised for sale whilst on site, unless by prior consent. 6. The rent is payable in advance, the proprietor has the right to alter the rental by giving due notice to plot holder. No refunds are given unless in exceptional circumstances. Any refunds granted are subject to a €30 admin fee. 7. In the event of the storage fee being overdue a “Legal Lien” will be attached to the stored goods and will remain in force until the arrears are settled in full or the “Lien” is otherwise discharged. 8. In the event of a negative response to notification of the Lien, the stored goods may be sold and the outstanding arrears will be deducted from the proceeds of the sale, as will any costs incurred. Any remaining balance will be retained to await your collection. The proprietor warrants that he / she will seek to attain the best price available on current market value. 9. The proprietor excludes all liability caused by vermin infestation. 10. By entering into this agreement the plot holder warrants that he/she has both ownership and legal title to the stored goods. 11. In the performance of this contract of bailment, the proprietor will at all times act with due diligence in providing secure storage. 12. The proprietor excludes all liability for loss or damage by whatever cause, where the circumstances are in excess of the duty of due diligence.